IE Password Remover is the free tool to quickly and easily remove the stored website login passwords from Internet Explorer. It automatically detects IE version on your system and use appropriate technique to successfully decrypt all the stored passwords. Once recovered, you can either remove selected ones or all of the stored passwords with just a click. 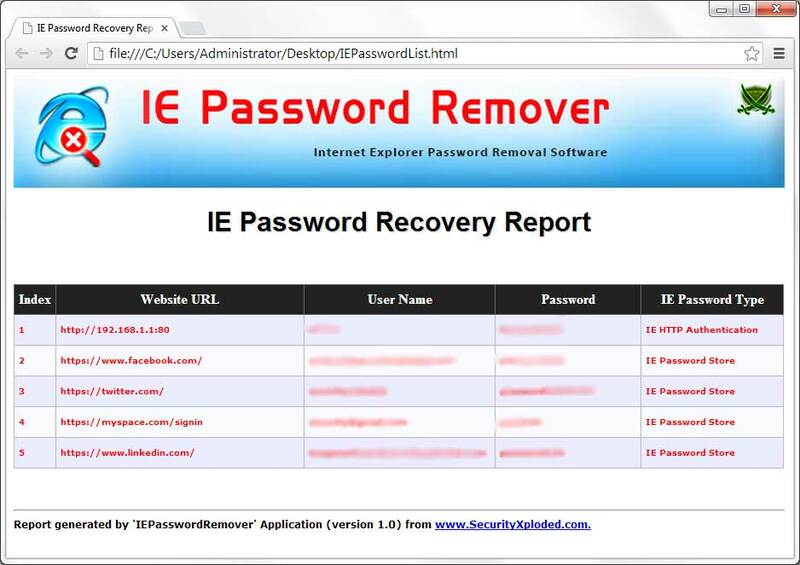 One of the unique feature of this tool is that it can recover and remove passwords (from IE v7-v9) for popular websites without depending on the history using the Smart URL Recovery technique. Also it can recover both HTTP Basic Authentication (router/modem) as well as Autcomplete passwords. It supports all versions of IE from v7.x to v10.0 (except on Windows 8). It is fully portable and works on both 32bit & 64bit platforms starting from Windows XP to Windows 7. IE Password Remover comes with Installer to make it easier to install it locally on your system for regular usage. This installer has intuitive wizard which guides you through series of steps in completion of installation. IE Password Remover is easy to use tool with cool GUI interface. 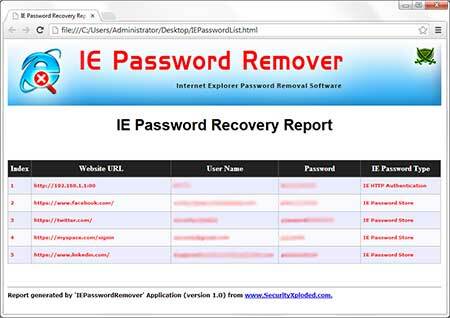 Screenshot 1: IE Password Remover showing the recovered passwords from IE login password store. Currently it works on IE version from v7.x to v10.0. However it does not support password removal from Internet Explorer v10.0 or higher on Winodws 8. Mega release with a support to generate password recovery report in CSV (Comma-Seperated Values) File Format. Added right click context menu to quickly copy the password. 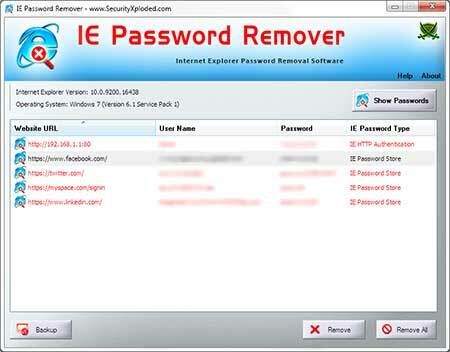 IE Password Remover is designed to help users to protect their privacy and online security by recovering & removing the password from IE.